Hay Cave (23SN1) was excavated and published by Lee M. Adams, an amateur archaeologist and trustee of the Missouri Archaeological Society. His research at the cave was published in the Missouri Archaeologist (Adams 1958); he received the "MAS Achievement Award" in 1957 in honor of his careful research. This site is situated on private property and it is not open to the public. The stone tools he uncovered are typical of the Archaic Period (7000 - 1000 BC) and Woodland Period (1000 BC - AD 900) in the Ozarks region of Missouri. Adams (1958:182) reported that he had excavated 25 grit tempered pottery sherds typical of the Late Woodland Period (AD 500 - 900) and 5 shell tempered pottery sherds typical of the Mississippi Period (AD 900 to 1400). 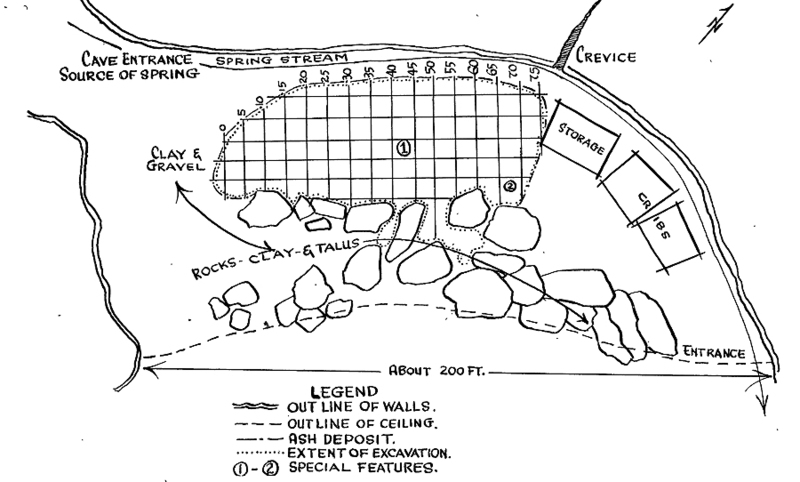 Plan of Hay Cave published by Adams (1958:Figure 92). Adams made careful plans, controlled his excavation by a grid system, and published his results with detailed drawings; his work is praiseworthy. 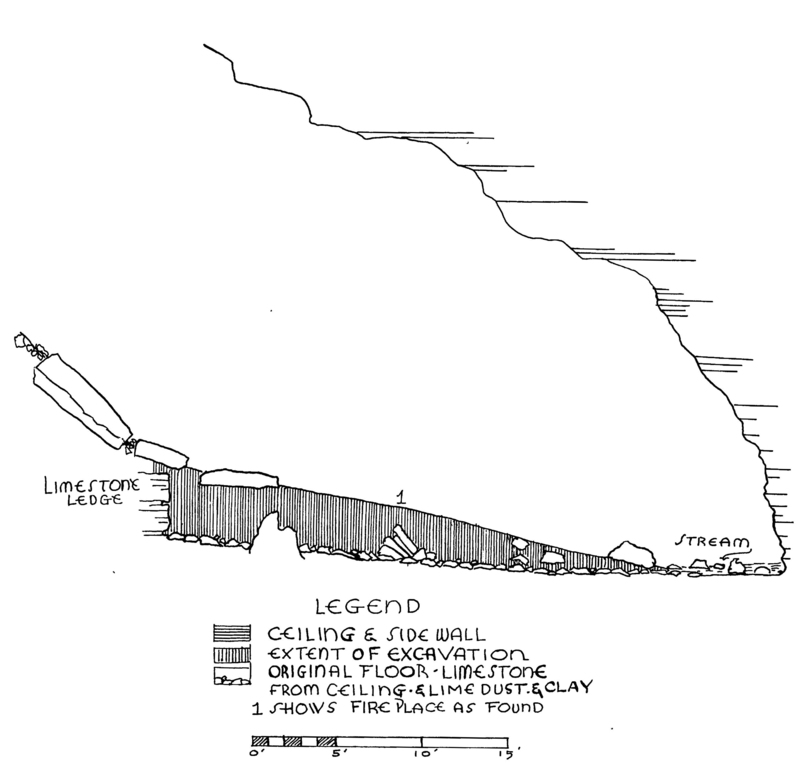 Profile of Hay Cave published by Adams (1958:Figure 93). 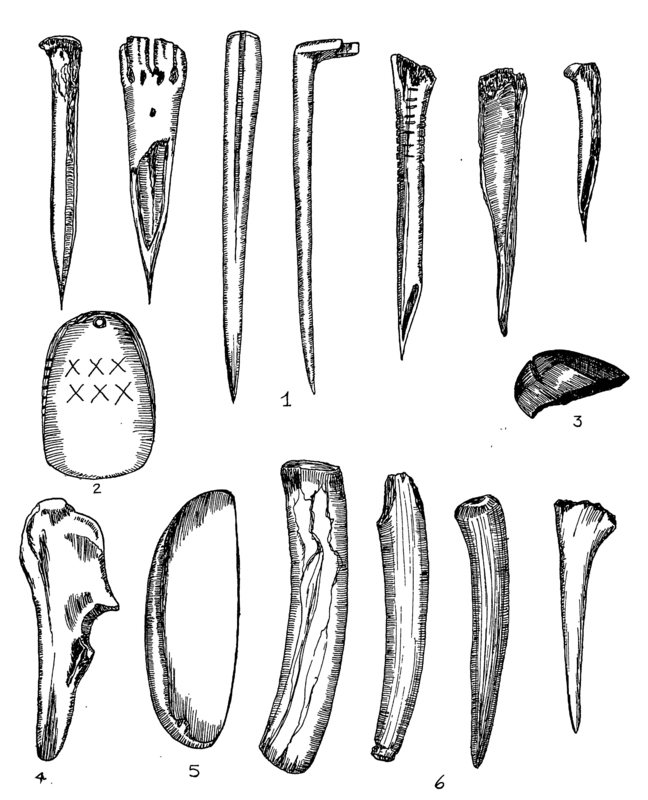 Bone tools excavated from Hay Cave and published by Adams (1958:Figure 98). 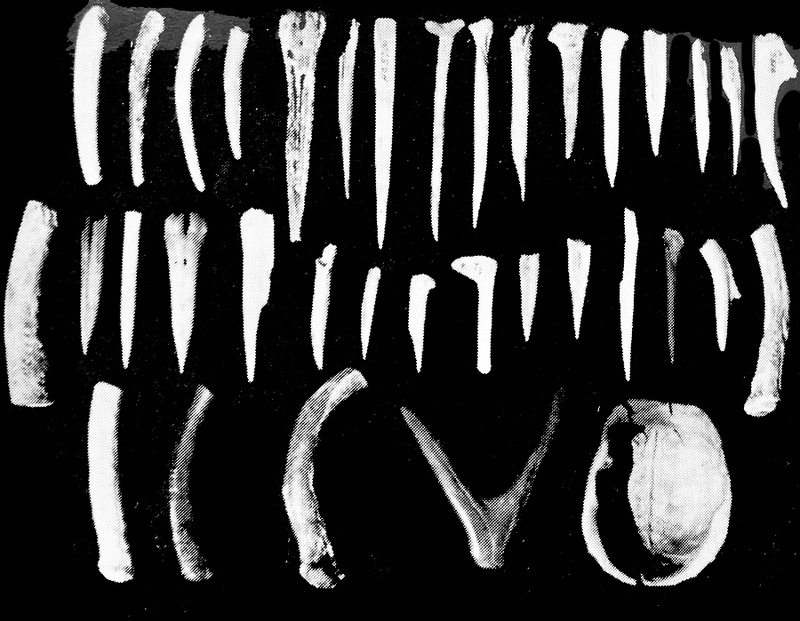 Bone tools excavated from Hay Cave and published by Adams (1958:Figure 95a). 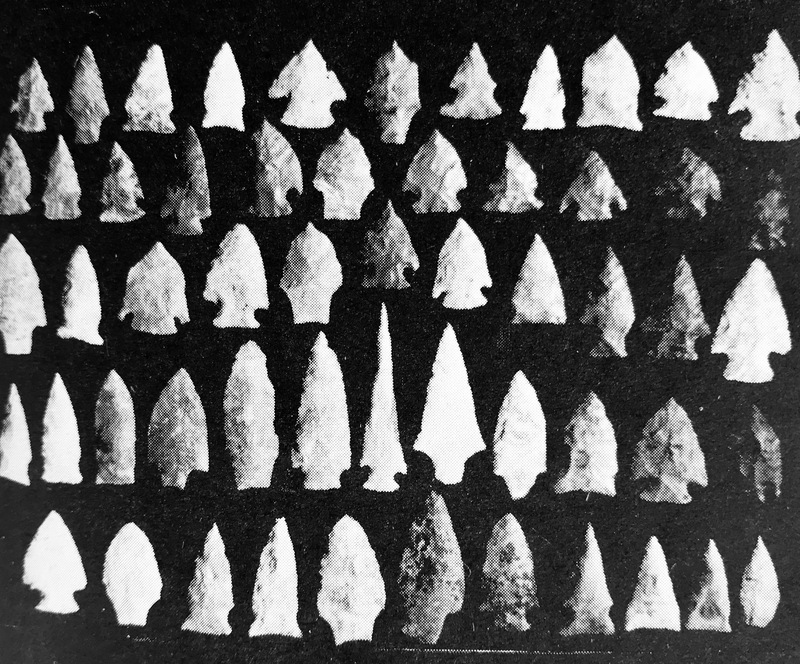 Projectile points excavated from Hay Cave and published by Adams (1958:Figure 95b). 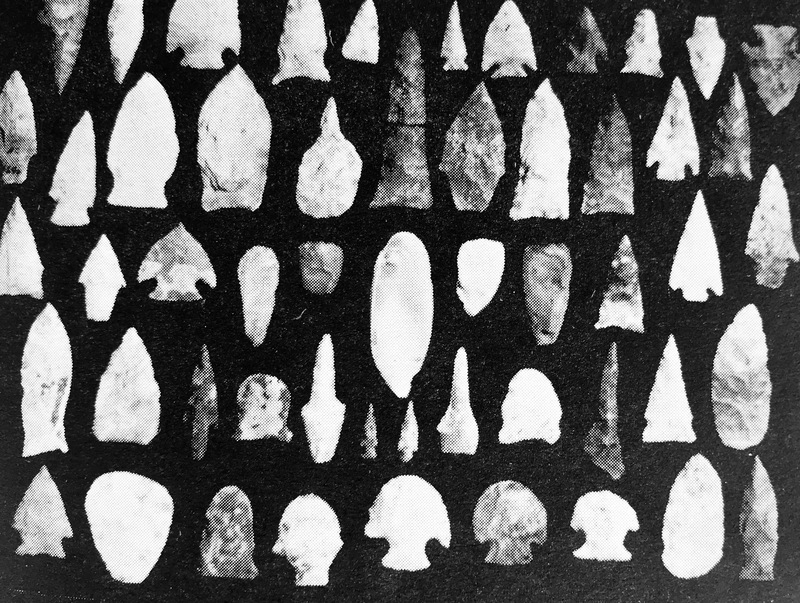 Projectile points excavated from Hay Cave and published by Adams (1958:Figure 95c). 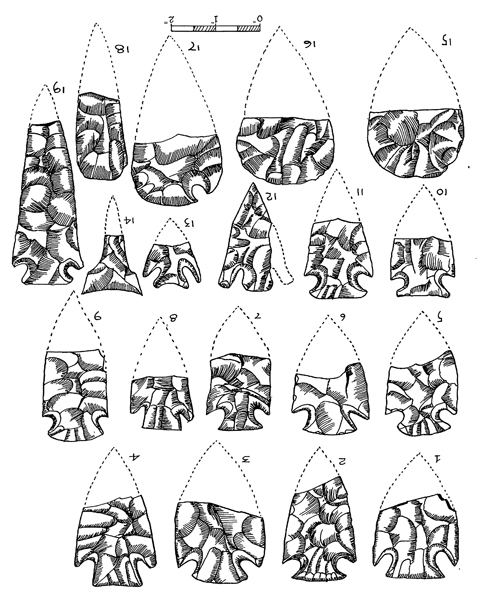 Pottery sherds excavated from Hay Cave and published by Adams (1958:Figure 99). 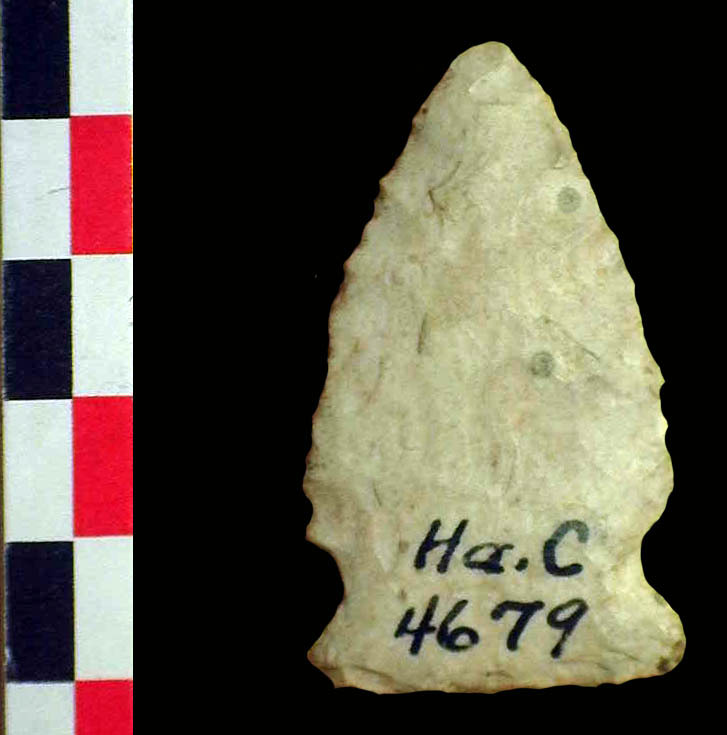 Projectile point excavated from Hay Cave by Adams (1958). Registration number 5430. This artifact weighs 7.2 grams. Length = 42.8 mm, width = 26.1 mm, and thickness = 7.3 mm. 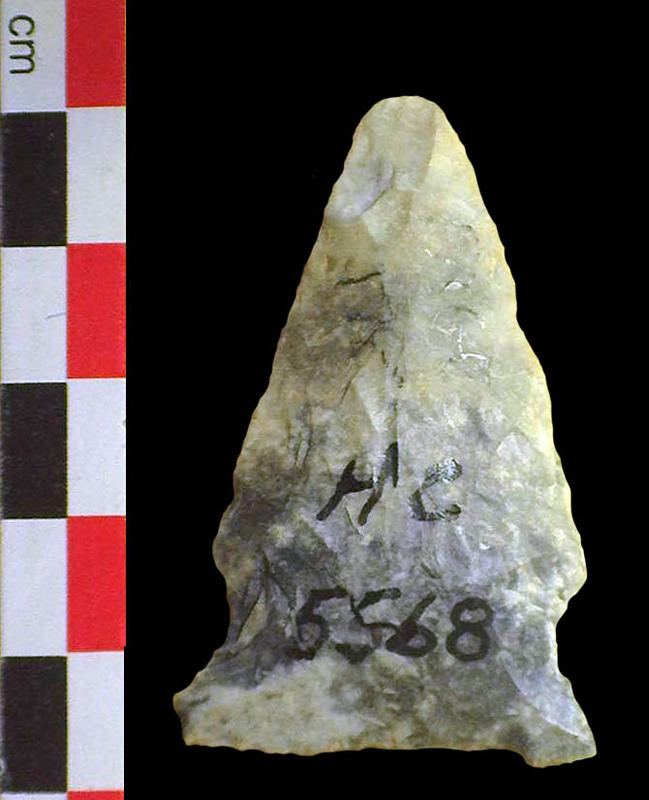 Resharpened Rice Side-Notched projectile point excavated from Hay Cave by Adams (1958). Registration number 5568. This artifact weighs 8.6 grams. Length = 43.9 mm, width = 20.5 mm, and thickness = 8.5 mm. 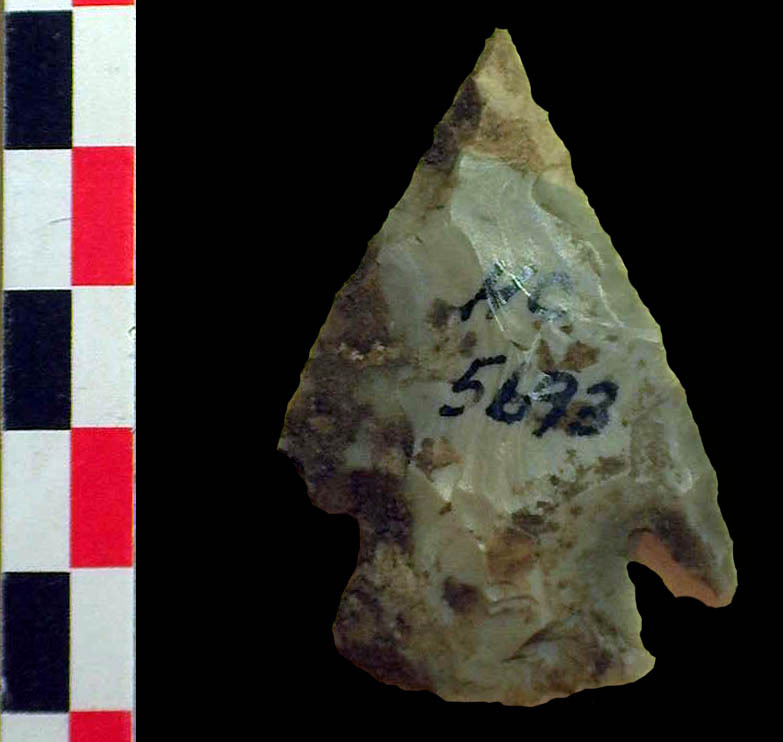 Rice Side-Notched projectile point excavated from Hay Cave by Adams (1958). Registration number 4679. This artifact weighs 7.1 grams. Length = 46.1 mm, width = 26.6 mm, and thickness = 5.6 mm. 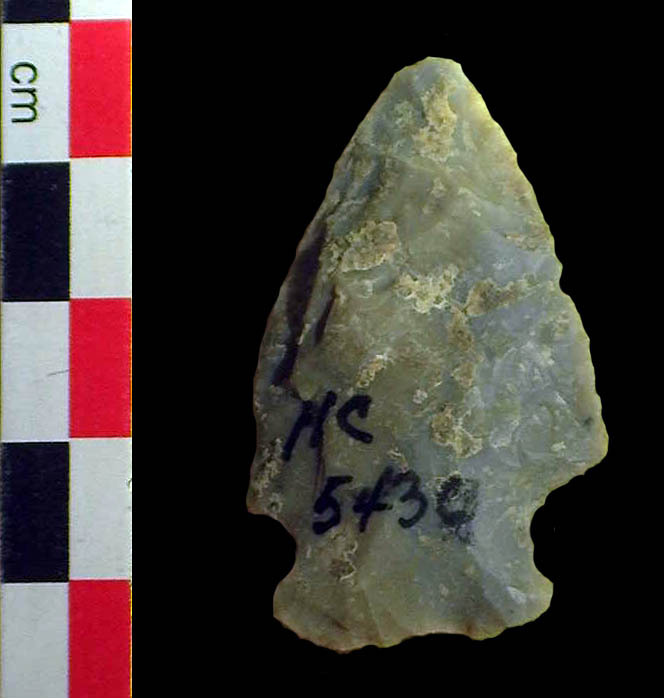 Afton projectile point excavated from Hay Cave by Adams (1958). Registration number 5446. This artifact weighs 9.8 grams. Length = 50.7 mm, width = 32.0 mm, and thickness = 6.4 mm. 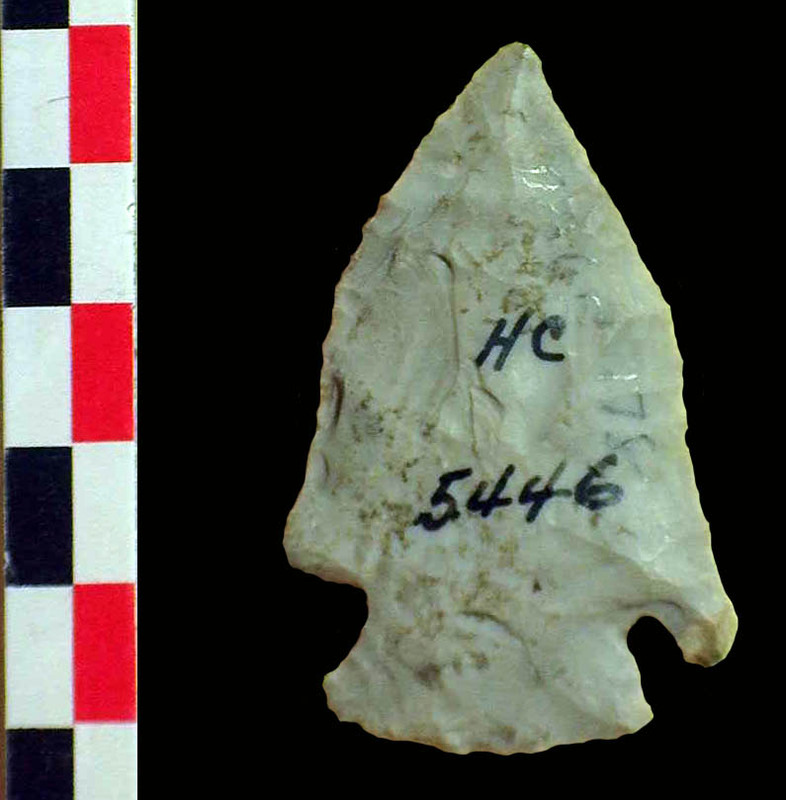 Projectile point excavated from Hay Cave by Adams (1958). Registration number 5693. This artifact weighs 8.2 grams. Length = 48.1 mm, width = 29.3 mm and thickness = 6.8 mm. 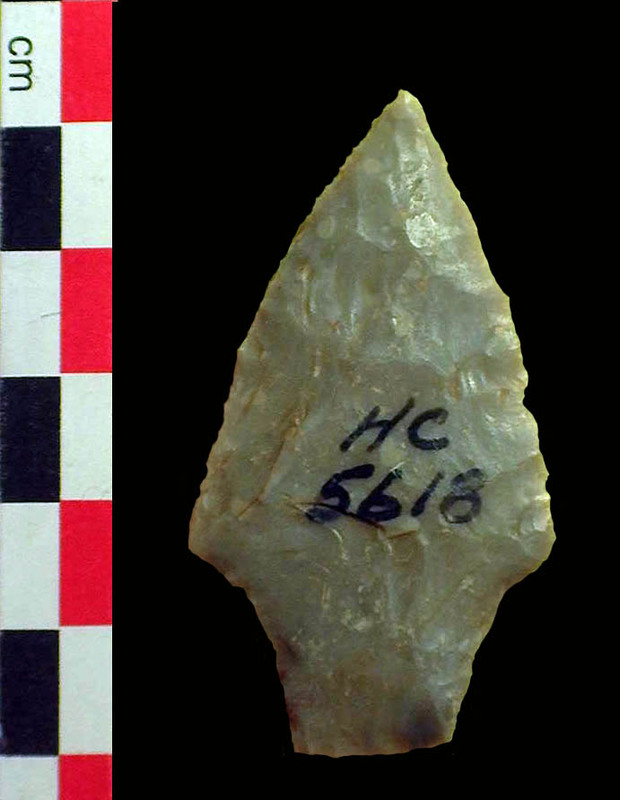 Langtry projectile point excavated from Hay Cave by Adams (1958). Registration number 5618. This artifact weighs 7.2 grams. Length = 52.9 mm, width = 28.9 mm, and thickness = 5.4 mm. Many thanks to Stephen Burks, a member of both the Missouri Archaeological Society and the Central States Archaeological Society, for making the artifacts from Hay Cave available to me for study.